Tried the girly, dainty look today. Loving the knee high socks I bought from Saizen for P25! :) Darz, if you're reading this--this is your sunglasses! Borrow. :) Heh. It's pretty obvious that I'm inlove with this shoes. It's sooo comfy and the heel height is just right. I'm not usually a fan of the Eastwood bazaar (most of the items on sale are tacky and cheap) but I guess my lucky stars aligned that night! Heee. Speaking of bazaars, here's one you shouldn't miss! Everything will be discounted from toys and clothes to high end designer items and fine jewelry. Present the flier at the entrance and get 20% off entrance fee!!! 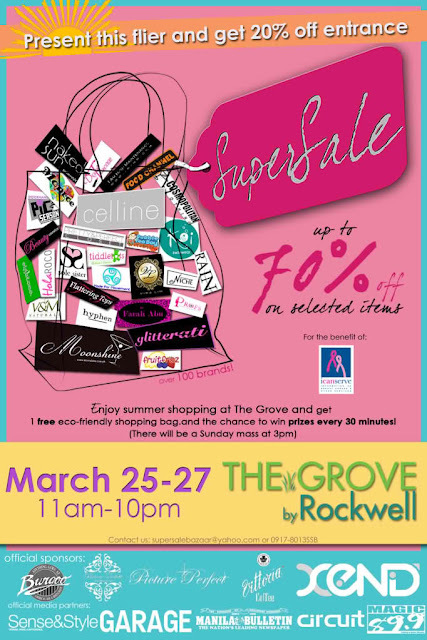 There will be Sunday mass at the side of the grove at 3pm so you won't have to miss mass when you go shopping! For those of you who have no idea where The Grove is, it's just after the bridge from libis--left side It's pretty big so I'm pretty sure you won't miss it. It's in front of tiendesitas. i follow you, visit my blog if you want !! THOSE ARE MINE!!!!!! You have to treat me to pancit canton in exchange!!!!! those are mine you hear me. miss you na gyud mga igat. Darz - bwahahaha! okay pancit canton in exchange for the glasses. As in lucky me? hehehehe miss you na super busy mo lng!! !